Vera Faye Heard obituary. Carnes Funeral Home. Mar 29, 2013 Sincerest condolences to family and friends and may you rely on Jehovah who is a refuge and strength, a helper that is readily to be found during distresses. ~~With Sympathy~~ R.A.
On morning June 22, 1926 in Lubbock, Texas, Vera “Faye” Banks was born into this world. Mother Heard departed this world on the morning of March 21th, 2013, She was the beloved daughter of Charlie and Cornelius Banks. Faye was the 14th of 16 children. She accepted Christ as her personal Savior and was baptized at an early age. She remained faithful to God throughout her life. She was educated in Lubbock public school. At Nineteen, Vera married a young soldier, Exil Johnson on September 13, 1945. From this marriage three children were born; Vera Lynn, of Detroit Michigan, Exil Jr, and Mary Lois of Friendswood Texas. In the coming seasons Mother Heard was graced by GOD and her children with 5 grandchildren and 14 great-grandchildren. After relocating to Ecorse Michigan, the family united with First Baptist Church under the leadership Pastor Joe Davis, where she faithfully served until relocating to Portland, Oregon. In Portland, she united with the New JerusalemBaptist Church under the leadership of Pastor Madison. There she continued her service doing GOD’s work thru various church organizations. In 2000, Vera joined her children (Exil and Mary) in Friendswood, Texas. Where she continued keeping with her church covenant, she united with the Bible Way Fellowship Baptist Church under the leadership of Pastor Ivory Varner, where she remained active until her health failed. “Mother Heard, Sister Vera, Granny, Mother, Faye”, was a virtuous woman, she was steadfast praying, loyal, loving mother, grandmother, great-grandmother, sister, aunt, mentor, confidante and friend. She was an encourager for all those who came in contact with her. She was elegant Christian woman who exemplified the fruits of the spirit in her daily life. She truly loved her children, grandchildren, great grandchildren, friends, church members, and not to forget all the Golden Age members. Mother’s favorite bible scripture was the 23 and 27th Psalms, which she taught to each and all of her grandchildren. Mother’s favorite saying was “I won’t complain”. Her favorite song was “Oh How I Love Jesus”. “Sometime life would knock her down, but she would always get up never ceasing to pray and fighting even harder.” We often wondered what “stuff” she was made of. On March 21st, 2013 God said “Faye it is time to come home with me”. She is preceded in death by her mother Cornelious Toliver-Banks, her father Charlie Banks, and her sisters, Gloria Jean Scott, Sara Nell, Bessie Mason, Callie Moore, Elizabeth Hepburn, Alma Banks, Lucy Banks, and brothers Claudis (Joe) Banks, Charlie Banks Jr., Robert Lee Banks, Tommy Banks, Davy Banks, C.D. Lewis Banks, and James Arthur Banks. 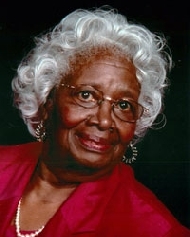 Her memory will always live in the hearts of her beloved family; her children, Vera Lyn Coleman of Detroit Michigan, Exil Johnson Jr. and Mary Lois Bell of Friendswood Texas; her grandchildren, Exil III, Darrell, Xetavior, Corey, and Corbett; her great-grandchildren, Darryl, Dejah Sujuan, KyMarrell, Darrell Jr, Devin Exil, Exil IV, Marcell, Darien, D’Mychael, Reyana, Nailah, Niara, Nigel-Royce, Corey Jr, Nizoni, and Zabarie; a host of relatives and devoted friends, the entire Bible Way Fellowship Baptist Church Family, Friendswood Prayer Group, the Golden Age Group, life long friend Ms Billie Triceand of course First Lady Mary Varner. The list of Special friends goes on and on and on. Thank You all who have known her is to love her.